On 27th June 1976 an Air France aircraft was hijacked by two terrorists and forced to fly to Entebbe airport in Uganda. The hijackers were joined by three more gunmen at Entebbe and demanded the release of 53 militants held in jails in Israel and four other countries. Uganda’s President and dictator Idi Amin arrived at the airport and gave a speech in support of the hijackers. He supplied the hijackers with extra weapons and ordered Ugandan soldiers to help guard the hostages. 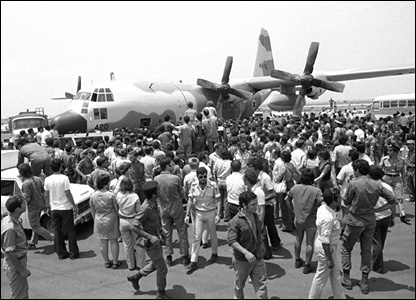 On 1st July, the hijackers released a large number of hostages but continued to hold captive the remaining 100 passengers who were Israelis or Jews. Those who were freed were flown to Paris and London. The crew were offered the chance to go but chose to stay with the plane. The remaining hostages were transferred to the airport building. The hijackers then set a deadline for their demands to be met or they would blow up the airliner and kill the hostages. But their plan was foiled by a dramatic Israeli military raid. Ugandan soldiers and the hijackers were taken completely by surprise when three Hercules transport planes landed after a 2,500-mile trip from Israel. About 200 troops ran out and stormed the airport building. During a 35-minute battle, 20 Ugandan soldiers and all seven hijackers died along with three hostages. The leader of the assault force, Lieutenant Colonel Yonatan Netanyahu, was also shot dead. He was the elder brother of Binyamin Netanyahu, who was Israel’s Prime Minister from 1996 to 1999. Idi Amin was humiliated by the surprise raid. He believed Kenya had colluded with Israel in planning the raid and hundreds of Kenyans living in Uganda were arrested and massacred soon afterwards. But from this time, Amin’s regime began to break down. Two years later Idi Amin was forced into exile in Saudi Arabia. He died in Jeddah in August 2003.